There is a reason that the wheel has remained the wheel for so long. A long time ago, someone was like “yo, this works really well” and it hasn’t changed much since. That was the case for a long time with the Corsair V from Arai. It was the best in the business, the true top of the line when it came to race helmets. Now, however, that story is about to change. The introduction of the Arai Corsair X helmet comes with much fanfare, and for good reason. After years of topping the charts with its little brother the Corsair V, the Corsair X stands as the culmination of countless man-hours and diligent design specs that were put forth by the helmet gurus at Arai. As one of the top handful of motorcycle helmet makers on planet earth, the folks at Arai are not the type to introduce a new helmet for the sake of newness alone. The Corsair X is expected to showcase improvements in both comfort and protection. While information regarding specifics is at the moment, slim, there are a few features that have just been made available to the public. 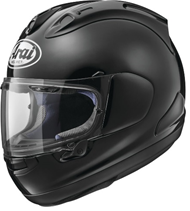 In their re-design of the Corsair, Arai has decided to put new attention towards functionality and comfort. From a new faceshield mechanism that will be easier to work with, to better venting, a lighter shell, and improved aerodynamics, we are are all waiting with bated breath to see this bad boy in its final form. All in all, the Corsair X from Arai is going to be the king Great White in an ocean of barracudas. They are all top notch, they are all super sleek, they are all razor sharp… but the Corsair X will take the head seat at the table for family dinner.